No matter how I old I get, there will always be a little rush of nostalgia any time I see a Choose Your Adventure (CYOA) cover. So when Z-Man Games put out a CYOA game, there was no question that I'd be checking it out. As you can see, they didn't mess with success and stuck with the iconic cover design. The box comes packed with a lot of cards which I'll discuss as I explain the game part. The worst thing about the game is the box insert that's supposed to keep everything organized. If I weren't a collector minded person, I would just toss it out and put everything in Ziploc bags. 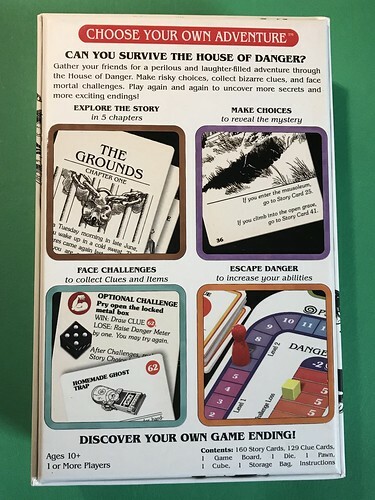 I should note that although this is billed as a "cooperative adventure game" adaptation of a CYOA book, it plays the same solo or with a group. The basic story is that you are detective and psychic investigator that has been having recurring nightmares that lead you to said house. Your mission is to get to the bottom of these visions! Playing the game is like reading the book. You start with the chapter one card and then follow your choice to the indicated number card. The story is broken down into five chapters which provides good places to stop if you don't have time to do it all in one sitting. 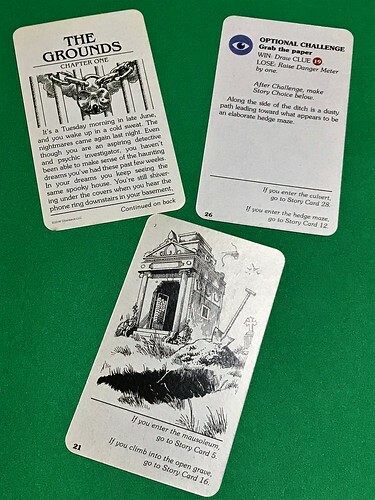 Each chapter has it's own deck of story and clue cards to go with it. 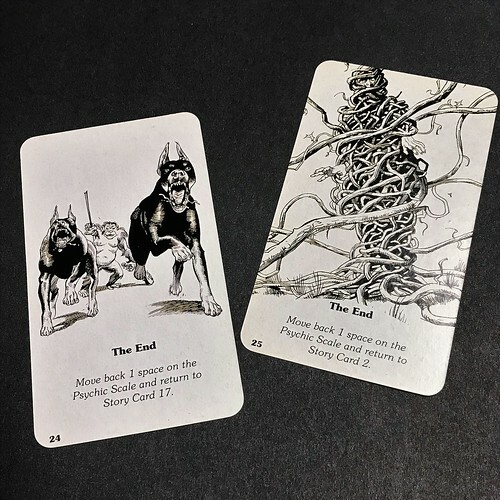 Just like a CYOA book, the cards offer you choices during the story. But there are a few additions that make it more interesting than just reading aloud. Some parts of the story have challenges (upper right) that have to be overcome. 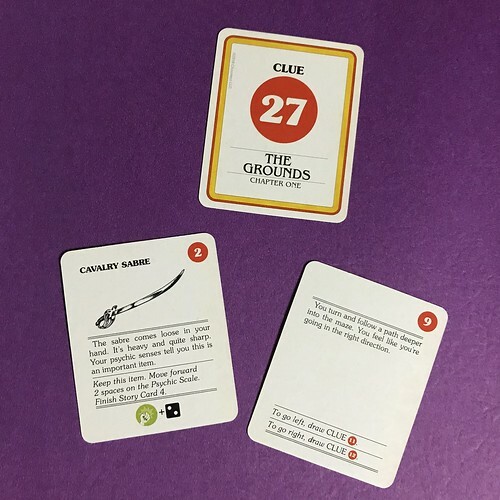 There are different items you can find on your journey, represented by clue cards, that might help with certain challenges. The icon on the bottom of the saber below shows that it gives you +2 in fighting challenges. As you play through the story, you'll be instructed to adjust your psychic scale and the danger meter. 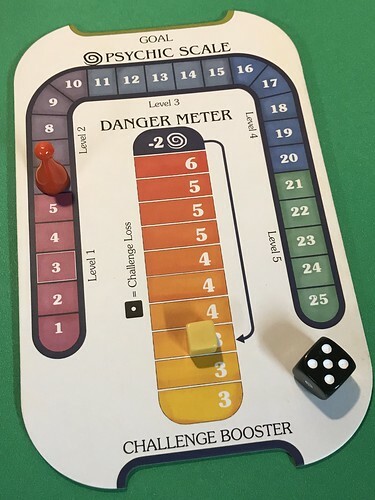 To take on a challenge, you roll a die and have to roll equal to or greater than your current danger meter level. As the game goes on, the danger meter creeps upward, making it harder and harder to beat any challenges. If the danger meter gets to the top, you reduce your psychic score by 2 and reset the danger level to where the arrow points. Your psychic level can help you out during the story by allowing you to discover things, giving you additional story choices, or even premonitions! If you remember anything about CYOA books, it's probably that you died (or failed) a lot. I know when I used to read these I always kept one finger on the page before turning to the next section in case I made a bad choice. Here, a premature ending will reduce your psychic score and let you pick up at the previous story. Death is only a minor setback. I played through the first chapter on my own and had a pretty good time with the additional mechanics. I especially liked the clue cards which give you a physical representation of your item inventory. The danger meter can make you feel like the game is stacked against you as it creeps higher but it eventually resets itself. This is made as a party game and I could see it being fun with a few more people to share the experience. If you grew up with CYOA, I'd say it's definitely worth checking out. It will hit all the nostalgia buttons for you from the box cover to the card art on down to the font used on the cards, this is CYOA. The only "downside" for me is that it is more of a game because you have to have a play area so it's not something you can pick up off the nightstand for a quick adventure before bed. But I could always just pick up a book or two for that. You could just as easily get a couple CYOA books and read them aloud as a party game. The extra game elements do make this something different and give you more options but I don't see it as something I'd return to once I finish it. More than likely, I'd skip the game parts and just read through the cards like I was reading a CYOA book to explore the possible choices. 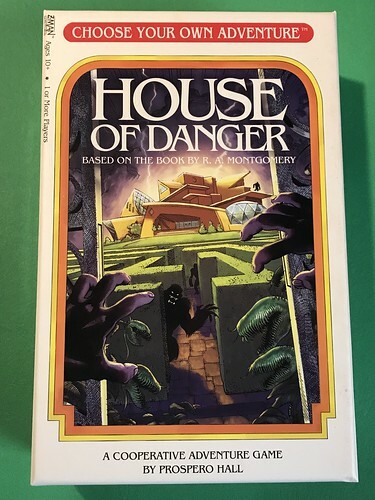 House of Danger retails for $25. In stores so far I've only found it at Target. 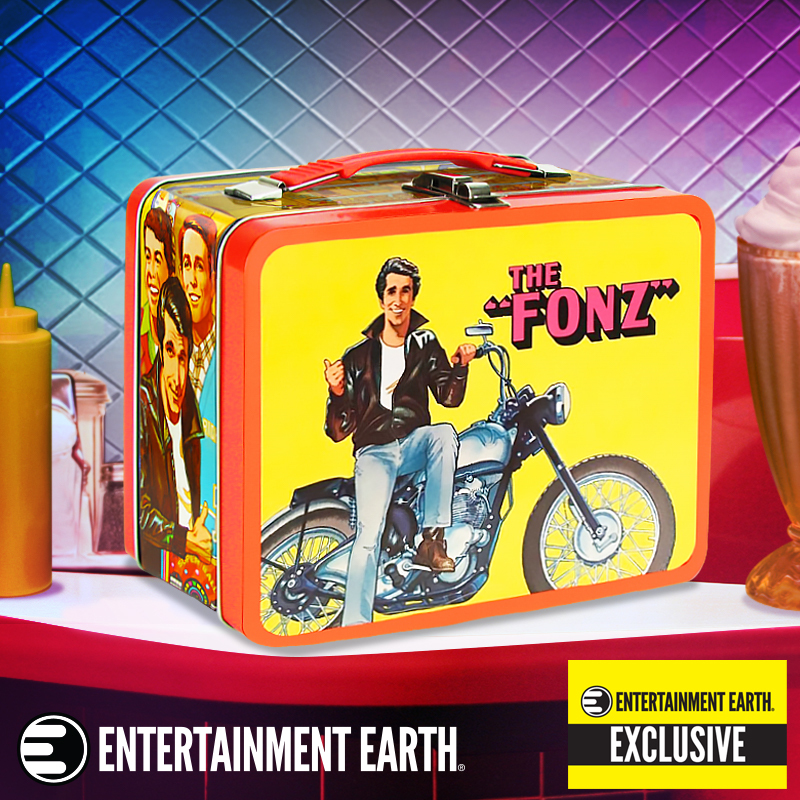 It's also available online at retailers like Amazon. 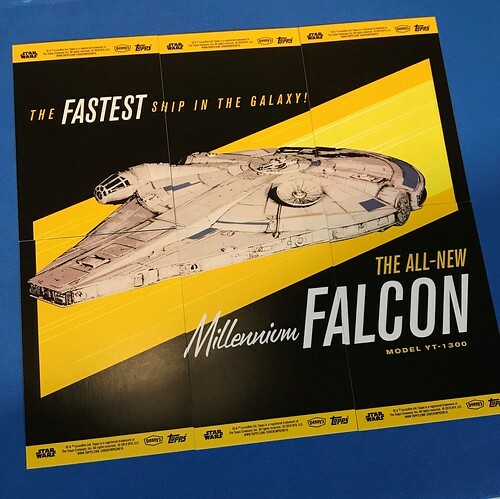 Just prior to Solo's release you might remember seeing cross promotional ads with Denny's. 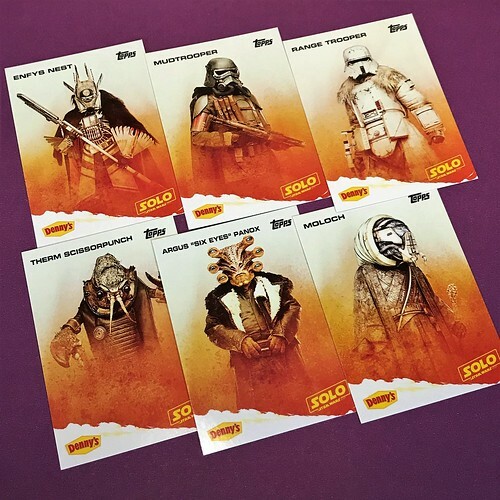 In addition to some special Solo themed menu items, you could also pick up exclusive trading cards. In my opinion, they had one of the best tie-in commercials ever. The cards were $3 for a pack of 2 and there were 12 to collect. You might be thinking $3 is high for 2 trading cards but they were also donating $1.75 of that to the charity No Kid Hungry. A win for everybody! I didn't pick these up when they came out because my local Denny's had closed down and the closest one was 30 miles away. But thanks to a Facebook trading group, I was able to get the whole set for other cards I had sitting around. The set of 12 is split into 2 groups of six: good guys and aliens/bad guys. I don't know why they picked Val here, she's not in the movie that much. I would have gone with Beckett since he has a bigger role. Even though Rio doesn't have that big of a part, I would have liked to see him too. I really dig his design and he's a fun character. I mostly like the card design, they almost look like Old West posters. I think they might look better if the shading was behind the character instead of covering their bottom half. It would make them pop off the card more. The really neat thing with these cards is they have a puzzle on the back. This was one of the big cool factors for me as a kid with the original Topps cards way back when. Of course then, I didn't have the whole puzzle right away and getting those pieces was what made it fun. Here's the Empire and aliens half of the set. Where is Dryden Vos, the big baddie of the movie? Admittedly, he's not as cool to look at as any of these characters. And ol' Thurm Scissorpunch has gained a cult following of his own. I mean, you can't go wrong with that name! And here's the back of the second half. 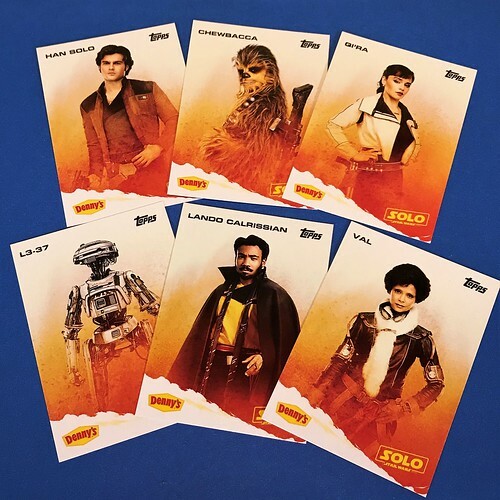 I haven't really seen the retail Topps Solo cards but I'm guessing this artwork ended up on a card there. 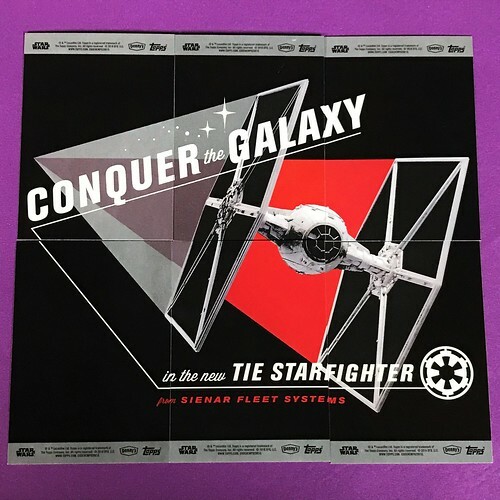 I like the style of the art and that it's like an ad you'd see in the Star Wars galaxy. If you're looking to pick up these cards, you can find them on Ebay for around $20 for the set. If you're a "it's not a set until I have every variant card" type of person, be warned! Each of the 12 cards in the set has a foil variant that were inserted into 1:100 packs. Never tell me the odds indeed! 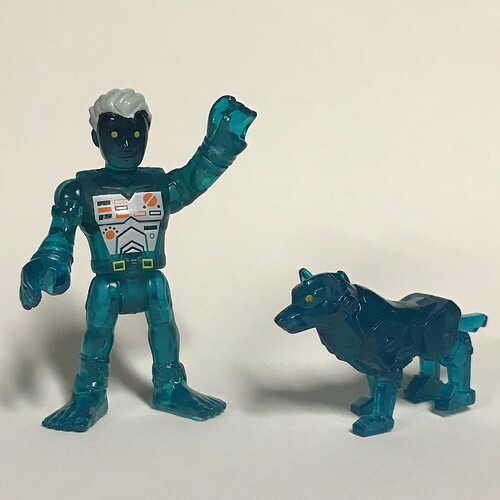 Most of the time when a new wave of Imaginext blind bagged figures comes out, there is usually one that is a monster of some kind or will fit in to the spooky/Halloween theme. There isn't really one in this latest wave but there are some freakin' awesome tributes to toy lines you might remember! 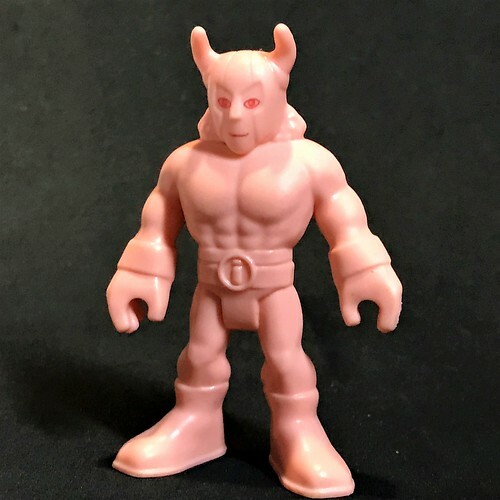 First we have a pair of M.U.S.C.L.E. figs. That's right, two for the price of one! I don't know why but I never got into this line when it was in its prime. I also never got into Monster in My Pocket. I have no idea how I never picked up either of them! I'm still not sure why I picked them up now, I guess just to round out the tribute figures in this wave. These figures are just as eraser-pink as you'd expect them to be. They're different from the standard Imaginext figures in that the entire figure is molded as a single piece. The limbs are a little bit rubbery and they have zero articulation. The guy on the left looks like some kind of bare-chested barbarian with his flowing locks and horned helmet. The one on the right is Muscleman (I think?) 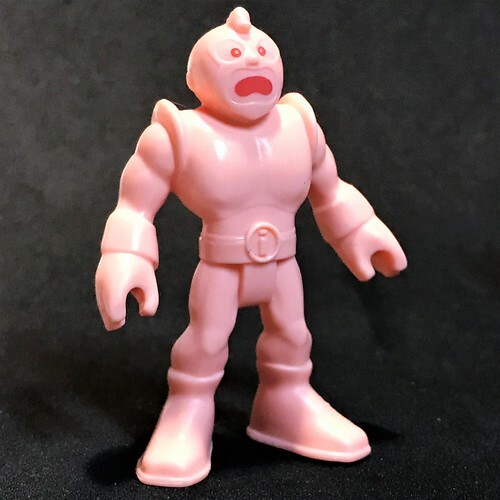 the wrestler guy who appears on some of the original packaging. Now Battle Beasts are a line I did collect and had quite a few of them. I say had, I may actually still have them squirreled away in my parents basement somewhere. 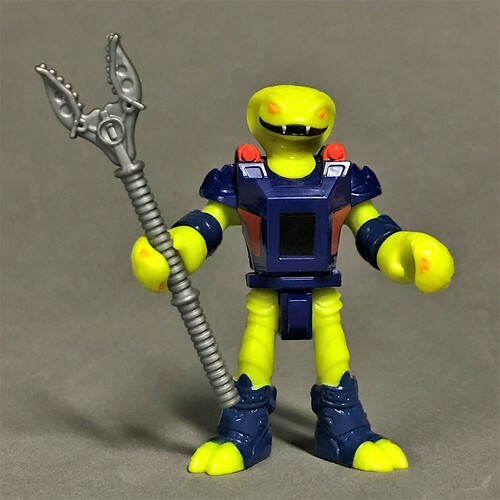 Sure the snake looks a bit more humanoid but there's no mistaking the armor color and the snake hands. 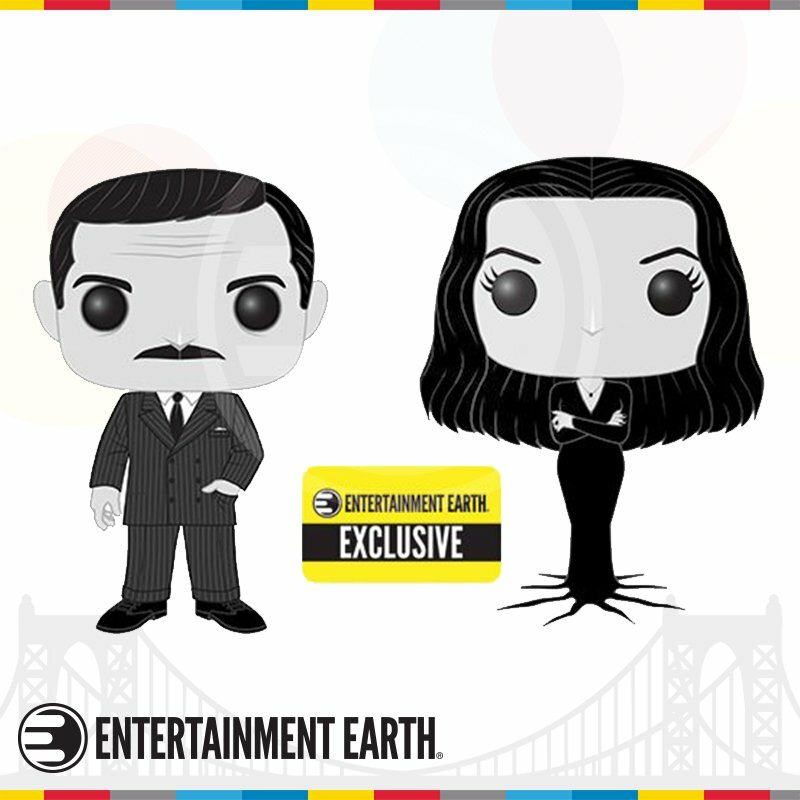 They even went so far as to put a black square on the chest to represent the heat sensitive sticker the actual figures had! Sadly, no matter how much you rub that square, there is no hidden image that will appear. I even tried again while writing this post to make extra sure. 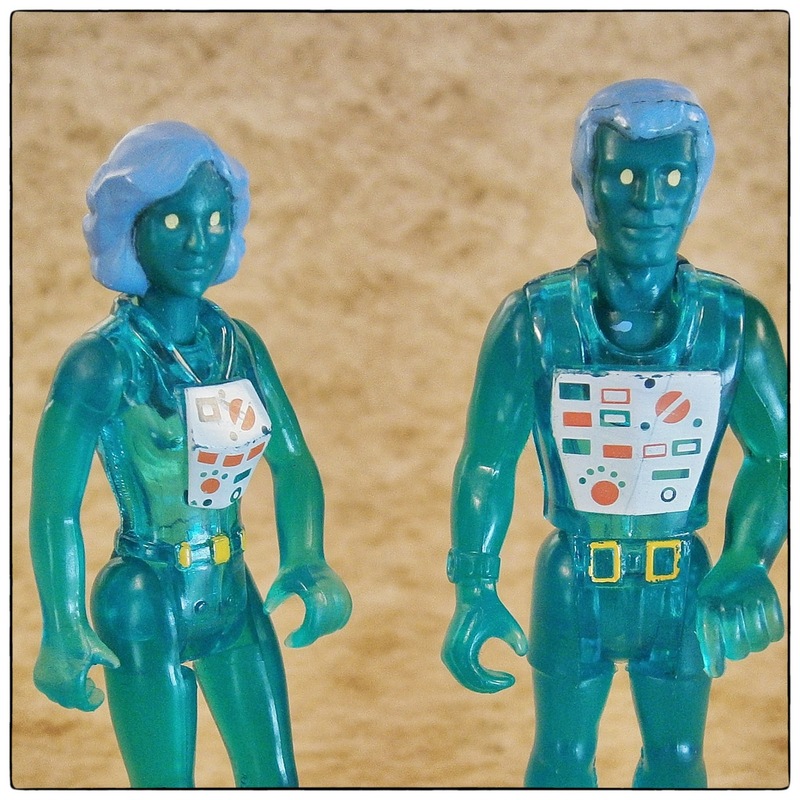 The last one is based on the Fisher Price Adventure People figures X-Ray Man and Woman. I found a photo of him with his "parents" and they make a cool little family. As a kid I had at least one friend that had Adventure People and they were always a line I wanted but never had (as far as I can remember). Now I can sort of check that off my list. Just like the originals, he's semi-translucent and you can see the joint articulation "bones". The dog is molded as a single piece so no internal bits to see on him...or maybe it's a her? I don't know how to tell X-Ray dogs apart. If you're looking for any of these in the wild, Imaginext is kind enough to imprint a number in the top left on the back of each "blind" bag that tells you what's inside. This year seems to be flying by! I've seen plenty of people finding Halloween stuff in stores already which only means we'll start seeing Christmas earlier. Not a fan. I'm going to need to add a Netflix series section for these posts! I caught up with the latest season of Voltron. There's a great episode where they pretty much play D&D for the whole thing. I binged through both seasons of GLOW and loved it! If you haven't checked it out, you really should. It's not only funny but it's really well written. I also took in Kiss Me First which was not so much focused on the VR world as I was hoping but it was still an interesting story. And (whew!) I'm most of the way through Dark Tourist which explores tourist destinations that are known for their darker side. Word of caution: it is TV-MA and episodes 5 & 6 have animal killing/sacrifice. They don't directly show it on camera but it might be hard to watch for some people. I know I got a tiny bit uncomfortable. Anyway, let's go to the movies! I really like these movies that are more personal and less having to save the world. It's still aimed at a younger audience but I had a really good time watching it. It's a good cleanser after Infinity War. The 3D is decent but is totally worth it for the quantum realm parts. If You Really Gotta Go: Stay for the mid credits scene, the end credits scene not worth almost peeing yourself over. The first one was all about Mr Incredible, this one shifts focus to Elastigirl who's trying to keep the evil Screnslaver from making the world think heroes are bad. It's another fun, family film that all ages will enjoy. Honestly my favorite thing about it is the world design, it's really great! I was never big into wrestling and only tangentially aware of GLOW back in the day. I gave this a shot after watching the GLOW series and was surprised to see just how much the series used the real thing for inspiration. If you were a GLOW fan, you've probably already watched this. Even if you're not it's still a really good watch! A 2 hour+ clip show with people talking about horror movies. I've seen 18 out of 50 and some of those I'd consider obscure picks from this list. I've heard of all but 2 or 3 of them. If you're a horror fan (with Prime) it might be a good way to start an October movie list. Call me a bad horror fan. I haven't read the book or seen the original movie. This pretty much blew me away though! It's got all the heart of a summer coming of age film mixed with some damn creepy horror. So good! Another one where I haven't seen the original. We had free HBO for the weekend so I checked it out. It was good enough to keep me interested through the whole thing. The gore is good but some of the kills go a bit over the top almost putting them into cartoon land, especially the final one. The movie based on a video game few people have ever heard about! I always wanted the game but never got to play it back in the Amiga days but you give me a movie with giant bugs and I'm there. It's never creepy or gory and the humor is very uneven. I think if they embraced the humor more it could have been so much better. This was okay for me. I liked the first two well enough but I felt like I was watching a kids cartoon in a theater. Where a lot of adults will go see a Pixar film, I don't think most would go see this unless they had kids or are really into the franchise. I will admit a couple jokes did get me to laugh out loud. It does have a good message of acceptance for the kids which we can't have too much of.